I was hesitant to begin reading Redwall (story about mice fighting rats? ), but once I started it, I fell in love with the story and the characters. I can’t wait to start the next book in the series! Although the story is a little violent for younger readers, I still recommend it to anyone who is 10 or older. The story is engaging, fast paced, and has a simple plot. There is also a lot of action with tons of battle scenes that are never boring. Even with a simple plot it was still entertaining. There were not any boring parts or excessive details. It is definitely a page turner, especially for younger children. Many adults may not be able to get past the simple plot. It is an interesting story because everything is in the perspective of rats and mice, and other woodland creatures. You really end up being involved in the story as if you were really there. The characters are wonderful! There are many characters that the book focuses on including Matthias the mouse, Cluny the Scourge who is the evil rat, Constance the badger, Silent Sam the squirrel, and Warbeak the sparrow, just to name a few. They all are well detailed, have there own personalities, and some have their own dialect, which is very interesting. The moles are hard to understand, but their speech is rather entertaining, and I like the speech of the sparrows. The writing flows well and is easy to understand. However, the dialect of the moles is complicated to decipher and it is not always translated for you. There is some vocabulary that may be more difficult for younger readers, but nothing that is beyond their reach. 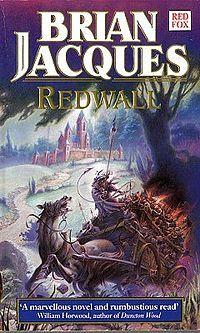 I really enjoyed Redwall and I would recommend it to anyone who is 10 and older and loves fantasy stories with a lot of different characters. It is definitely a fun read for both children and adults! A perfect book to read together. I can’t wait to introduce this series to my son. I thought the same when I started to reading Redwall 😀 like mice and rats….? Can this be any good. But it was just so good :3 I think I finished the whole serie in few weeks or so. I think however violence is a bit high and later it also turned so sad 😮 like children’s books that make you are…hmm…great ones. I’m glad you liked the whole series. I haven’t read any others yet, but I have been slowly collecting them over the year from our library book sale. Only .50 cents so its a great deal! I cant wait to read the ones I have. Just soooo many books on my reading list.